The Bull's Eye postage stamps are famous today. 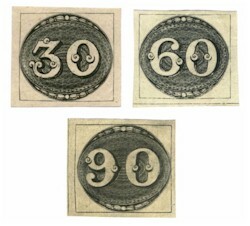 Issued at Rio de Janeiro in Brazil, these stamps were issued in August 1843 under three denominations: the 30, the 60 and the 90 Reis. These stamps are considered today as the second group of adhesive stamps in the world, following the famous Penny Black and the Two Pence Blue stamps. Their design does not include the country name. The unusual name derives from the ornamental value figures inside the oval settings. These stamps were arranged as ‘se-tenant’ pairs, that look like a pair of bull’s eyes. This concept of nickmaning the Brazilian stamps continued with the later issue of the smaller and rectangular design (snake’s eyes), the smaller but “bull’s eyes”-like blue design (goat’s eyes) and the black design (cat’s eyes).